Soup in a bread bowl has been calling my name like a banshee at night lately. The problem is that most restaurants like Panera Bread use chicken stock or high-calorie heavy cream, even on some of their seeming vegetarian bowls like the lentil and quinoa stew. 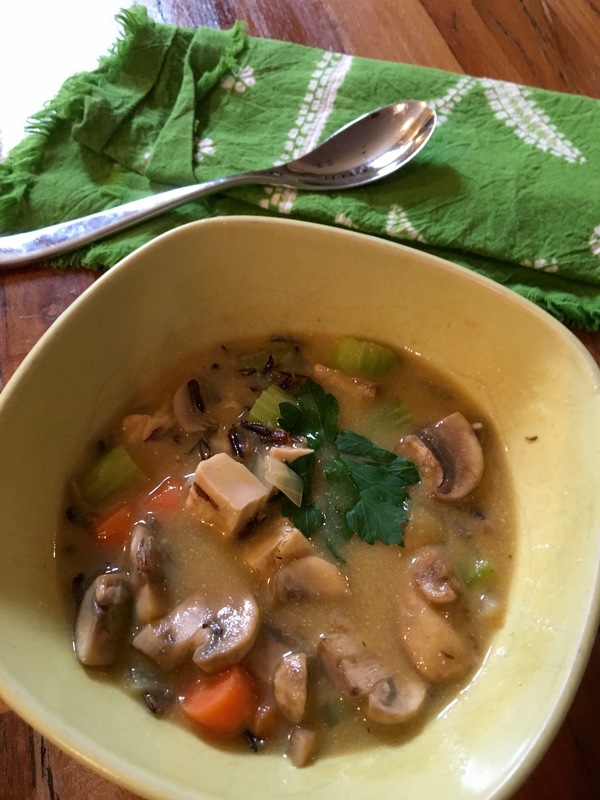 My dreams came true when I discovered this vegetarian reinvention of the classic winter dish Creamy Chicken Wild Rice Soup. It’s not vegan, but by eliminating the dairy altogether this could still be a very soul-satisfying dish. The key ingredients here are real wild rice for a flavorful, chewy bite (don’t give in to temptation and buy instant wild rice) and Beyond Chicken grilled strips – which I picked up at Target. The soft, meaty texture of the “chicken” pairs perfectly with the earthy mushrooms and thyme. But what really shines is the sour cream and flour base which makes a heavenly thick broth. Bread bowl not included in photo below …but it is coming soon! In a small sauce pot, combine 1 cup wild rice with 4 cups of water. Bring to a boil then cover and turndown to a simmer for 45 minutes. In the meantime, heat oil in a large soup pot over medium heat. 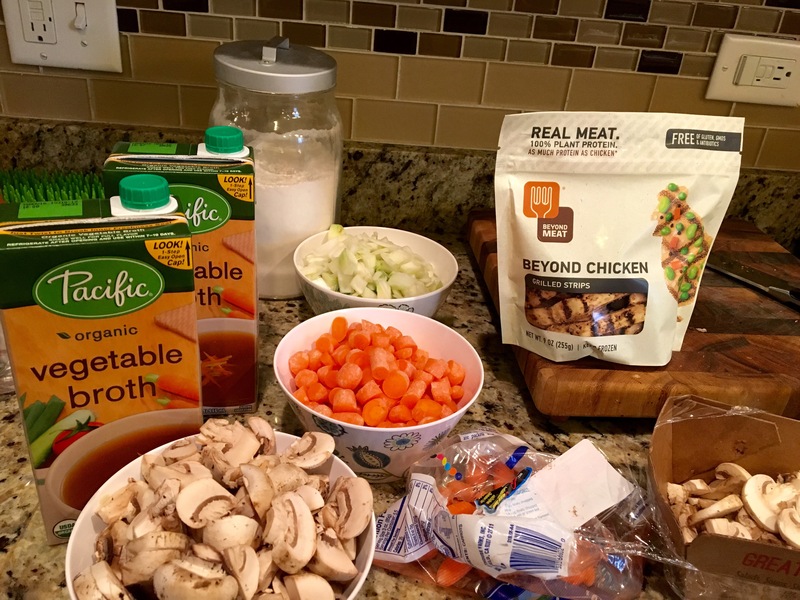 Add mushrooms, celery, carrots, chicken, and onion and cook, stirring often, until softened (5-7 minutes). Stir in thyme, flour, salt, and pepper and cook for 2 more minutes, stirring constantly. Add broth and bring to a boil. When wild rice is done cooking, add to the broth and simmer additional 5-7 minutes. Then stir in sour cream and parsley.